It is generally accepted by historians that the Paris treaties at the end of the Great War – and especially the Versailles (so-called) Treaty imposed upon Germany – directly contributed to the Second World War. The treaties further earn criticism for events of calamity even today. At Versailles, three relatively great powers (Britain, France, and the United States) were in control, more or less, of the process. That there were three necessitated many compromises amongst them – where would lines be drawn on maps, where would elections be held to determine government power, which factions from which regions would have a seat at the table, which of the numerous and conflicting promises made during the war would now be respected? The answers were derived via these compromises. No one government was in charge, no single entity could control or dictate the outcomes. One could (if feeling overly generous) suggest that this necessity of compromise contributed to the disasters that followed. Whatever blame there was to come out of these treaties was (and is) to be apportioned. Who to blame? It is all gray. When the Japanese gave up the fight in August 1945, the United States stood as the world’s one great global power. Grimsrud looks also at the Soviet Union, left standing at the time. In the Soviet Union, he sees a country that has lost tens of millions in the war with industrial production significantly harmed; the United States lost relatively few men in the war and came out of the war with industrial production completely intact – a uniquely powerful position among virtually all industrialized countries around the world. The Soviet Union was also basically a land army, confined to the geographic regions which it had occupied during the war. In the meantime, the US had those land forces surrounded – east, west, north, and south – with strategic naval and air force capacity sufficient to encompass the globe. So the answer to the world’s main question – what kind of peace will follow this terrible war? – lay largely in America’s hands. 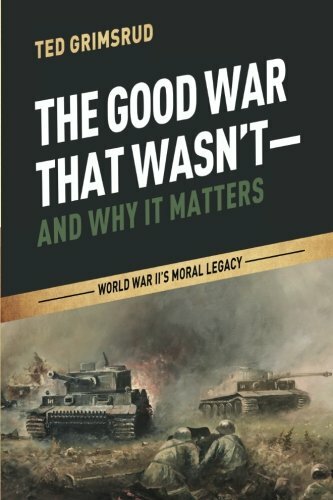 Of all of the powers in the war, the world had reason to hope due to the fact that it was America in this position – far better than the Soviets, Nazis, or Japanese. The world had in mind the statements in the Atlantic Charter, as just one example, of the moral high ground that America seemingly stood upon. The Charter stated the ideal goals of the war: no territorial aggrandizement; no territorial changes made against the wishes of the people, self-determination; restoration of self-government to those deprived of it; reduction of trade restrictions; global cooperation to secure better economic and social conditions for all; freedom from fear and want; freedom of the seas; and abandonment of the use of force, as well as disarmament of aggressor nations. The world saw sheep’s clothing. Yet, was there something underneath? Wolf or sheep, how does one know? By their fruits. What “fruits” were born from this tree? Groundbreaking was on September 11, 1941 (a coincidence worth pursuing at another time, perhaps). As an aside, it should be obvious that this was three months before Pearl Harbor. Leslie Groves led the project for the army – if you don’t recognize his name from one of his other pursuits, just wait a few paragraphs and I will come to this. Intended to be temporary – during the duration of the war – it became a permanent military fixture of the type unknown in America’s history. Symbolically (or maybe not) it was placed across the river and away from the civilian powers of government. At the end of earlier wars, America significantly demobilized – not to the pre-war condition, but still meaningfully. Perhaps more important than the physical demobilization after World War One was the psychological demobilization – during much of the 1920s and 1930s, the peace and non-interventionist movements in the United States were quite pronounced. Not so after World War Two. In 1947, the National Security Act formalized the country’s commitment to an unprecedented level of military presence. The Department of War – “war” suggesting a temporary condition – became the Department of Defense. Who could argue with the ongoing and perpetual need for “defense,” after all? All branches of the military now came under this one umbrella. And the umbrella now had a permanent station on the other side of the Potomac River. The Manhattan Project was launched on October 9, 1941 – yes, two months prior to Pearl Harbor. The aforementioned Leslie Groves led this project once his work constructing the Pentagon was complete. While the project was kept secret from the American people, Stalin was well-apprised of the situation given the level of infiltration by Soviet spies. The regular threat of the use of such weapons is one of the further legacies of the War. Grimsrud offers that the direction taken globally toward greatly furthering nuclear weapons development after the war was well within the US power to influence. The US chose massive nuclear armament. That the Americans had the weapon, used the weapon when it was not necessary (or even contrary) to any military purpose, and built hundreds more before the Soviets had more than a handful offered enough reason for the Soviets to greatly expand their program and for other countries to wish to be so armed. On at least 30 occasions since the atomic bombings of Hiroshima and Nagasaki, every US president has prepared and/or threatened to initiate nuclear war during international crisis, confrontations, and wars – primarily in the third world. And while insisting that all other nations fulfill their Nuclear Nonproliferation Treaty (NPT) obligations (India being one exception, and Israel, which has not signed the NPT, falling into a category of its own), the US government has never been serious about its Article VI obligation to engage in “good faith” negotiations for the complete elimination of nuclear programs. Everything about the nuclear weapons program was done in secret – at least for the American people. There have been untold and numerous “secret” military and weapons programs since this first major secret program was launched – secrecy making a mockery of meaningful democracy. The child of the Office of Strategic Services (OSS), itself born during the war, the CIA was given permanence in the aforementioned National Security Act of 1947. The report concluded that the OSS had done “serious harm to the citizens, business interests, and national interests of the United States.” It could not find any examples of how the OSS had contributed to winning the war, only examples of failure. Grimsrud offers several examples of failures during the war, including infiltration of the organization by German spies. Apparently Truman was set to disband the OSS, deciding this on September 20, 1945. Of course, the agency didn’t go down without a fight. Due to the increase of advocates for a confrontation with the Soviet Union (the Pentagon, after all, required a mission), Truman quickly changed his tune and appointed a “director of central intelligence” in January 1946. It was a short jump from there to permanence in 1947. The CIA basically failed every step of the way: it had no idea about the Soviet atomic bomb until it was actually tested; it offered little insight into the conflict that became the Korean War; several months after the war began, it concluded that the Chinese had not gathered in force, preparing to chase MacArthur almost completely off of the peninsula; even two days before the Chinese attacked, the CIA said such an attack was unlikely. Eisenhower, given much too much credit for his warnings upon leaving the office of the military-industrial complex, gave the CIA wings. Overthrowing the government of Iran then of Guatemala; the attempted overthrow of the government in Indonesia; the covert self-destructive engagement in Vietnam during the 1950s. The CIA claimed that the Soviets would have 500 ICBMs ready to strike by 1961. In fact, Moscow had…four. But such “analysis” gave further fuel to both the Pentagon and the nuclear weapons program. In a speech on March 12, 1947, President Truman announced that the United States would offer military assistance to interests in Turkey and Greece that were struggling with forces aligned with the Communist Party. Communism was to be the enemy, always and everywhere; military support would be offered to fight this enemy; most importantly, the US was demonstrably taking over the role previously played by the British as the main global empire. Shortly thereafter (in 1949), NATO was born. Since the end of the cold war, “terrorism” has taken the place of “communism” as the global enemy. Since 1945, the United States has been almost continuously at war – Wikipedia identifies 145 separate entries for the US during this time period. Some of the lowlights include: Korea (1950 – 1953); Vietnam (1955 – 1975, inclusive of all years with advisors); Bay of Pigs, Cuba (1961); Laos (1962 – 1975); Dominican Republic (1965); Iraq (1991 – present); Former Yugoslavia (1992 – 1996); Afghanistan (2001 – present); Yemen (2010 – present); Libya (2011); Syria (2014 – present). This says nothing of other CIA- and NGO-driven activities. After two great wars, it is fair to suggest that much of the industrialized world had grown tired of this method of solving disagreements; this is evidenced in the creation of regional and global bodies designed (however poorly) to maintain peace and improve trade. Instead of utilizing the possibilities offered by this reality, the United States government has either utilized these bodies to further war or ignored these bodies if they stood in the way of war. In almost every situation, the United States government took specific steps to increase tension and confrontation. The lack of peace that the world has seen since 1945 can be laid at the feet of the militarization of the United States.